This post could also be titled: how I planned to follow a cool recipe and then decided just to make something that tasted like my favorite baked ziti and was way better than the original plan. The recipe had leeks, dill, and feta cheese, and I spent all day convincing myself that I wanted to eat these things, but I absolutely did not; I went home and made it with onions, some basil pesto from the freezer, and mozzarella. It is pretty much my ideal food, but if you don’t like pasta with tomato sauce and cheese you shouldn’t bother making it. 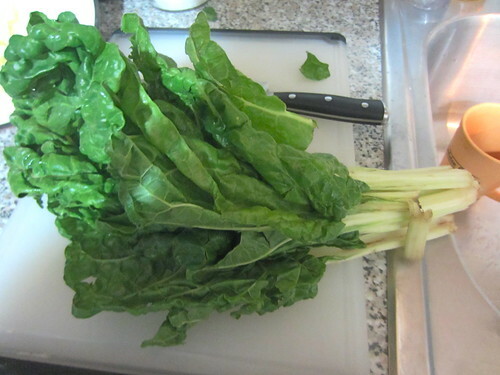 I will also do a tutorial on Swiss chard, since there have been questions. I love Swiss chard—it’s my favorite leafy green—but it has a very distinct and slightly weird taste, so you probably shouldn’t make it the centerpiece of your meal unless you’ve tried it. 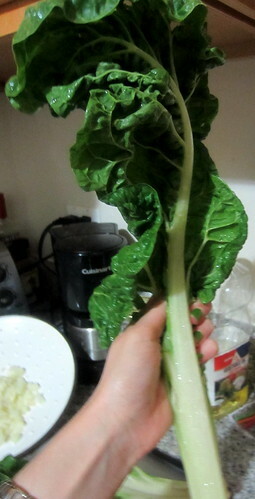 I really like it sauteed until entirely wilted and silky, with lots of garlic, red pepper flakes, and salt. So you should try this. Anyway, here’s a bunch of Swiss chard (regular, not rainbow—rainbow is prettier, but I don’t think there’s any other difference. Oh, Wikipedia says rainbow isn’t even a breed, just a bunch of different colors put together…). The stems don’t look great—most recipes tell you to throw them out, but this one uses them, which I like. But you still have to separate them, since the stems take much longer to cook than do the leaves. You fold the leaves together behind the stem and grip the leaves in one hand, near the stem; then you just use the other hand to pull the stem out. It’s easier than it sounds. I can’t describe it properly. It’s also not an exact science. This is maybe an excessive number of pictures of chard. 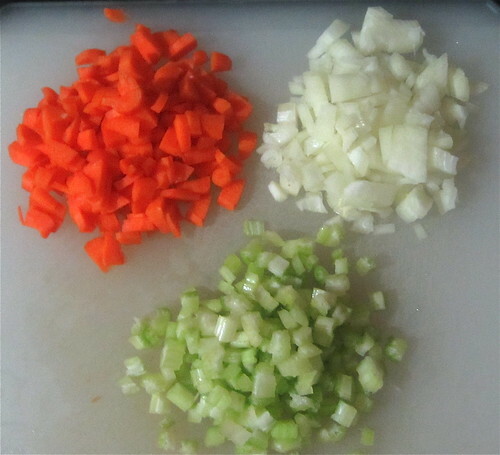 Then you combine it with onions, garlic, and red pepper flakes. For some reason, this smelled AMAZING. I mean, I thought it would smell good, but it just smelled ridiculously great. It was weird. Oh, also, you should be listening to the MOTH Story Slam while you do all this. This episode was on. In all sincerity you need to listen to the second one, “Franny’s Last Ride.” I have somehow heard it twice and may or may not have cried both times. Anyway. 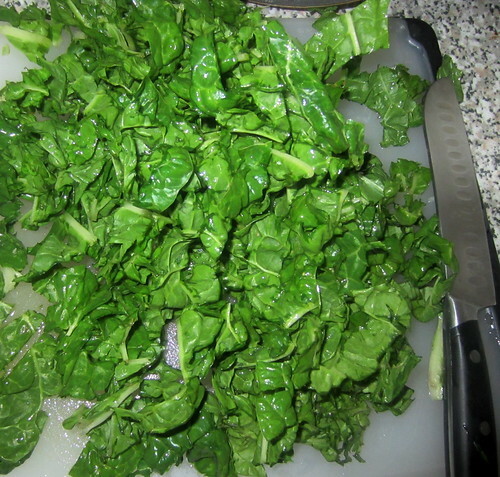 Add your chard leaves after a few minutes, then your tomato paste (TIP: You will never ever use a whole can of tomato paste before it goes moldy; stick it in the freezer) and then crushed tomatoes. I also added a few frozen tablespoons of pesto at this point, as a sort of substitute for the dill. I had added less oil than was called for at the beginning (possibly), so I figured the extra oil was OK at this point. Then orzo, cheese, etc., bake. I baked it for only twenty minutes and it was perfect and finished and bubbly and melty. This will not in any way serve six. Unless you and/or your friends and relatives eat far less pasta than you should. Preheat oven to 375°F. Spray a two-quart baking dish with nonstick cooking spray (or not. I cooked it on the stove in my Dutch oven and then just transferred the Dutch oven to the oven). Heat olive oil until shimmering. 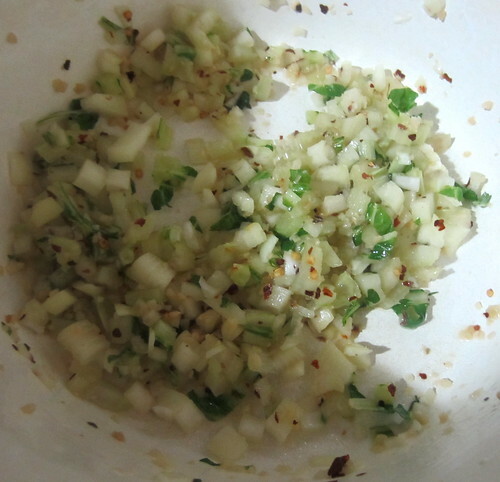 Add onion, chard stems, garlic, and red pepper flakes. Cook about four minutes, until not quite brown. (I don’t even know what that means. It’s not in the recipe.) 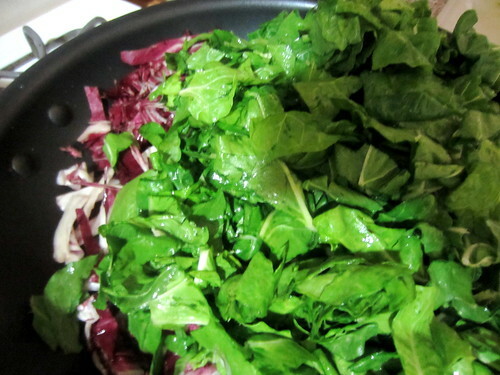 Add tomato paste and cook for another minute; add chard leaves and cook until wilted. Add crushed tomatoes and orzo and bring to a boil. If you’re using frozen pesto, you might as well add it now so it can defrost and become incorporated. Stir well and remove from heat. Add mozzarella cheese (and fresh basil, if using. I can’t comment on what happens to basil when you bake it but I assume it’s fine. Basil rules). At this point I just covered the Dutch oven with its lid and stuck it in the oven for twenty minutes; if you’re Dutch-oven-less, put a piece of aluminum foil over your baking dish and cover tightly. If you wish, uncover after twenty minutes and bake for an additional twenty. 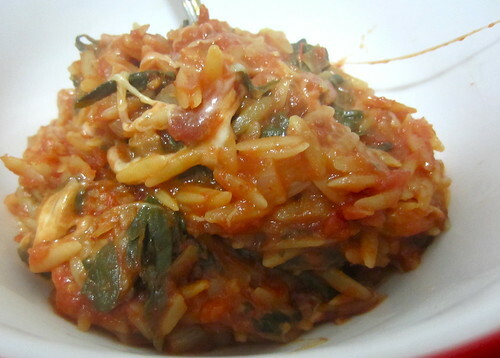 My orzo was cooked after twenty and I was OK with the level of browning so I didn’t bother. 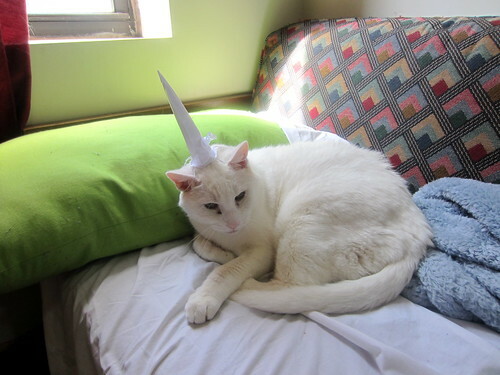 Something amazing recently happened to Fitzpatrick: he is now a unicorn. So I wanted to find a way to make pasta interesting, since usually I just put some things on it and that’s it. I am planning to do Swiss chard, chickpeas, and cheese (gruyere and/or mozzarella), in the vein of that one thing I made a while ago and took horrible cell-phone pictures of, but then I thought I would do a real tomato sauce. I have made tomato sauce before, but always just by throwing things into a pot of simmering crushed tomatoes—I wanted, this time, to do a big, real one. So I’m doing the one Marcella Hazan describes as “the most concentrated and the most strongly flavored”: Tomato Sauce I. I’m using canned tomatoes because it is April and there are no good tomatoes anywhere (and also because even when it is tomato season all the tomatoes I can ever find are nasty). There are very few pictures for this post, and all of them are very bad.